Active region 9169 was the host of the largest sunspot group observed so far during the current solar cycle. On 23 September 2000, the sunspot area within the group spanned 2,140 millionths of the visible solar surface, an area a dozen times larger than the entire surface of the Earth! 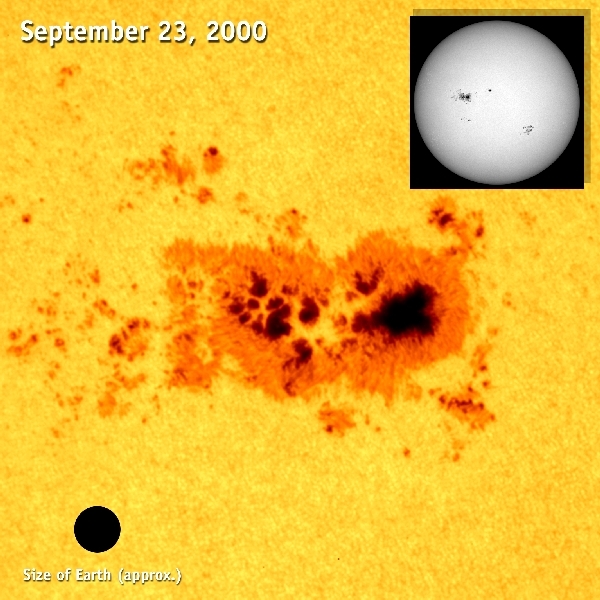 Caused by intense magnetic fields emerging from the interior, a sunspot appears to be dark only when contrasted against the rest of the solar surface, because it is slightly cooler than the unmarked regions.